Carbon nanohorns are horn-shaped (figure 2) nano carbon structures 2-5 nanometers (nm) in diameter and 40-50nm in length, which until now have been produced as radial spherical aggregates (figure 3). The newly discovered carbon nanobrush is a uniquely shaped material. 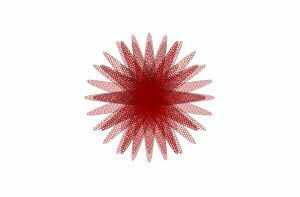 It is fibrous aggregates composed of radially-assembled graphene-based single-walled nanotubules, named here as fibrous aggregates of single-walled carbon nanohorns, whose structure resembles that of a round brush (figure 1). "The 'carbon nanobrush' is a new nano carbon material that, like existing carbon nanohorns, has high water and solvent dispersity, and high adsorptivity, including substance adsorption, but has more than 10 times the electrical conductivity than existing carbon nanohorns, an important characteristic for industrial applications," said Dr. Sumio Iijima, Senior Research Fellow, NEC Corporation. "With these characteristics, it is anticipated that the carbon nanobrush will help to improve the basic functionality of a range of devices, including increasing the speed of sensor and actuator responses, improving the output properties of batteries and capacitors, while increasing the electrical conductivity of rubber and plastic composite materials, as well as having application in a wide range of industries." 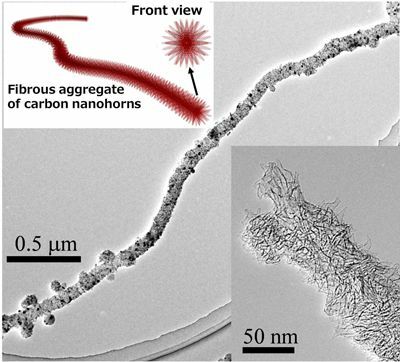 (1)Single-walled carbon nanohorns of 2-5nm in diameter and 40-50nm in length radially gather and are connected fibrously in several micrometers. (2)The single-walled carbon nanohorn which is a horn-shaped nano carbon structure with a large surface area radially gather and are connected fibrously in several micrometers. So it has a large surface area per unit mass (up to 1700㎡/g). (1)Dispersity Like carbon nanohorns, the carbon nanobrush has high dispersibility, dispersing in water and organic solvents, for example. This means that it can be easily mixed with a variety of materials, making it easy to improve its characteristics as a base material. 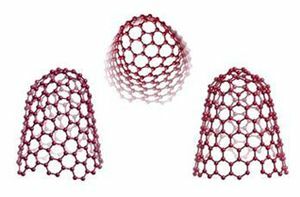 (2)Adsorptivity Like spherical carbon nanohorns, the carbon nanobrush can contain various substances in the nano-sized spaces inside the tubular structure, so it can be utilized as a high-performance adsorbent. When holes are formed on the surface of the carbon nanohorns by oxidation treatments, the inner space can be used, expanding the surface area by a factor of approximately five and greatly increasing adsorptivity. (3)Electrical conductivity As carbon nanobrush is a fibrous aggregate of radially-assembled carbon nanohorns, it has more than 10 times the electrical conductivity compared with existing spherical carbon nanohorn aggregates. As a result, they are highly effective in increasing the speed of sensor and actuator responses, increasing output properties of batteries and capacitors, and increasing the electrical conductivity of rubber and plastic composite materials. Carbon nanobrush can be produced at room temperature and under atmospheric pressure using the laser ablation method where an iron-containing carbon target (mass of carbon) is irradiated by a laser with high power density. The simple production process means that they can be produced efficiently and at a low cost when compared to the cost of other nano carbon materials. This technology was developed in part through collaborative research with the National Institute of Advanced Industrial Science and Technology (AIST). Carbon Nanotube: Carbon nanotubes are a carbon material first discovered in 1991 by NEC research fellow Sumio Iijima. They have a cylindrical carbon atom structure and are approximately the size (diameter) of 5-10 atoms. Carbon Nanohorn: Carbon nanohorns (carbon nanohorn aggregates) are a carbon material first discovered in 1998 by NEC research fellow Sumio Iijima. They are formed from an aggregate of several thousand cone-shaped structures 2-5nm (nanometers) in diameter and 40-50nm long to form a spherical shape approximately 100nm in diameter. Fullerene: Fullerene molecules are comprised of 60 carbon molecules clustered in a soccer ball shape. They were discovered in 1985. Graphene: Graphene is a monoatomic thin film in which carbon molecules are arranged on the surface in a hexagonal "honeycomb" lattice formation. The Nobel Prize in Physics 2010 was awarded jointly to Andre Geim and Konstantin Novoselov "for groundbreaking experiments regarding the two-dimensional material graphene."